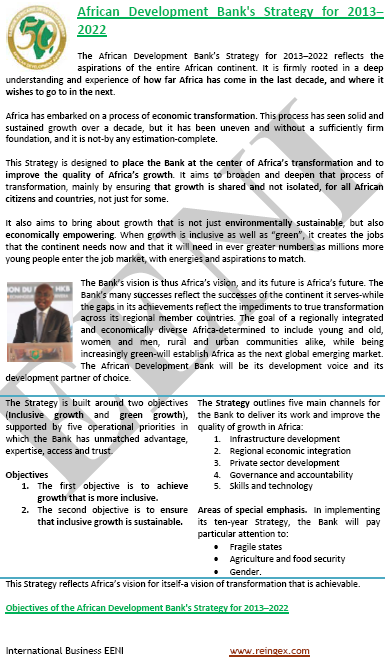 Syllabus of the Online Course (Subject): African Development Bank Group. Nigeria Trust Fund. Doing Business with the African Development Bank. 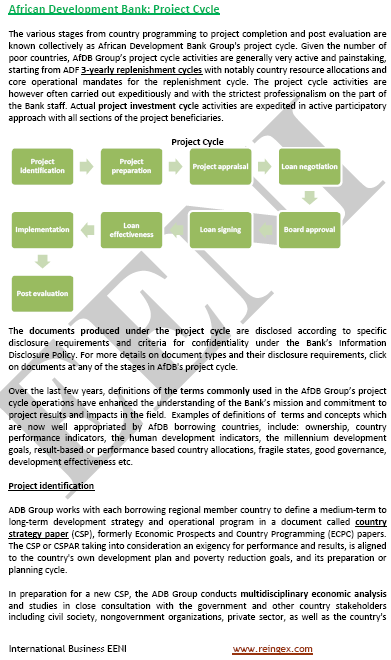 Description of the Online Course: African Development Bank. 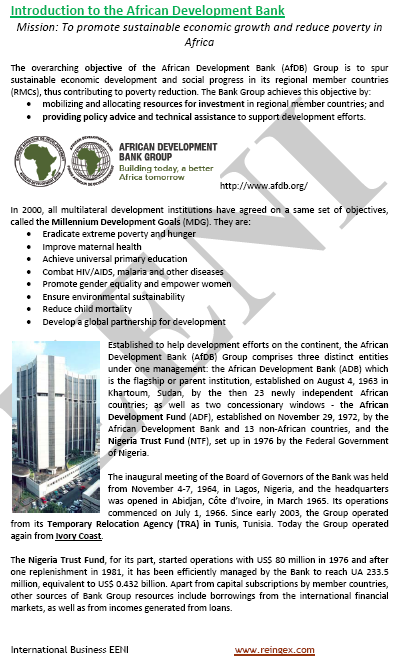 The African Development Bank is a multilateral development bank whose shareholders include fifty-three African countries (regional member countries) and twenty-four non-African Countries (America, Asia, and Europe). The African Development Fund is managed by the African Development Bank and includes the Member States (donor countries) and recipient economies. 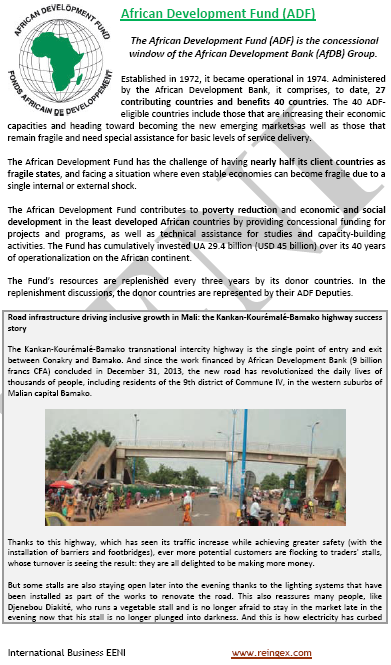 The main objective of the African Development Fund is to reduce poverty in Africa by providing loans and grants. The Nigeria Trust Fund is a special African Development Bank fund created in 1976 by agreement between the Bank Group and the Government of Nigeria. The objective of the Nigeria Trust Fund is to assist the development efforts of low-income regional African Countries whose economic and social circumstances and forecasts require concessional financing. In 2014, the African Development Bank returned to Abidjan. The African Development Bank belongs to African Civilisation. 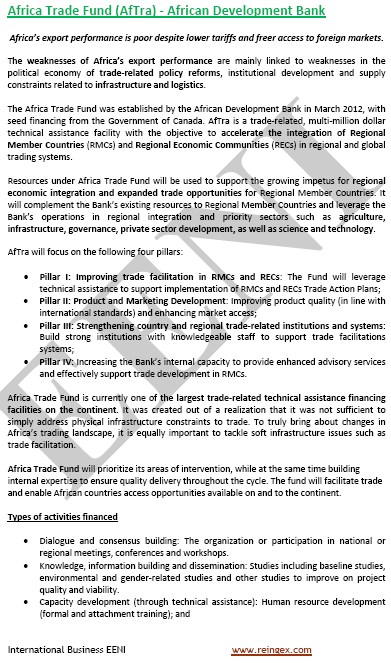 African Regional Economic Communities (REC). Most of the Member Countries of the African Development Bank are small, undiversified and face physical, political, and policy-induced constraints to deeper economic integration with their neighbour's countries and the global economy. However, the economic cooperation and regional integration are fundamental if Africa surpasses trade barriers and take its rightful place in the global market. 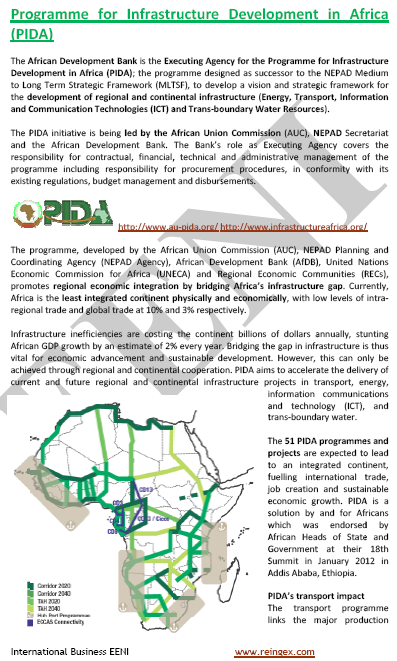 In the last forty years, the African Development Bank has promoted Regional Economic Communities (REC) through regional economic cooperation, international trade growth, capacity building and renewed assistance for the New Partnership for Africa's Development (NEPAD) programs. The African Development Bank also collaborates with national governments and pan-African organisations; it is of particular importance with the African Union (AU) and the United Nations Economic Commission for Africa (ECA) to rationalise and streamline the Regional Economic Communities structures. African Development Bank - regional member countries.